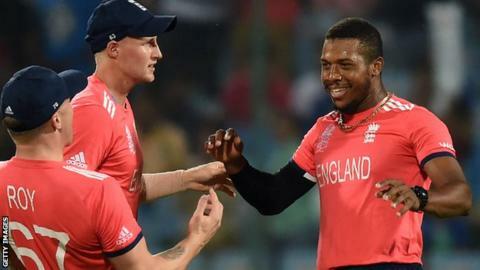 Sussex could be without Chris Jordan for the whole of May after the England pace bowler agreed a deal to play in the Indian Premier League. The 27-year-old will fly to India on Saturday to join Royal Challengers Bangalore as an injury replacement for Australia's Mitchell Starc. "It is an exciting opportunity, and one that he mustn't turn down," said Sussex coach Mark Davis. "We hope the experience he will gain will benefit us when he returns." Jordan has yet to play for Sussex this season after the England and Wales Cricket Board (ECB) ordered him to take a break until the beginning of next month. He has been resting an elbow injury since the World Twenty20 in India, in which he took six wickets in six appearances as England finished runners-up. Bangalore's final IPL group fixture is against Delhi Daredevils on 22 May, with the IPL final taking place on 29 May, meaning Jordan will miss the start of England's Test series against Sri Lanka which begins on 19 May. However, despite being a regular in England's limited-overs side, he has not been chosen for the Test team for almost a year and ECB director of cricket Andrew Strauss said he was "happy to support" Jordan's decision. "Participating in the tournament will be a good opportunity for him to further develop his white-ball skills and experience," added Strauss.